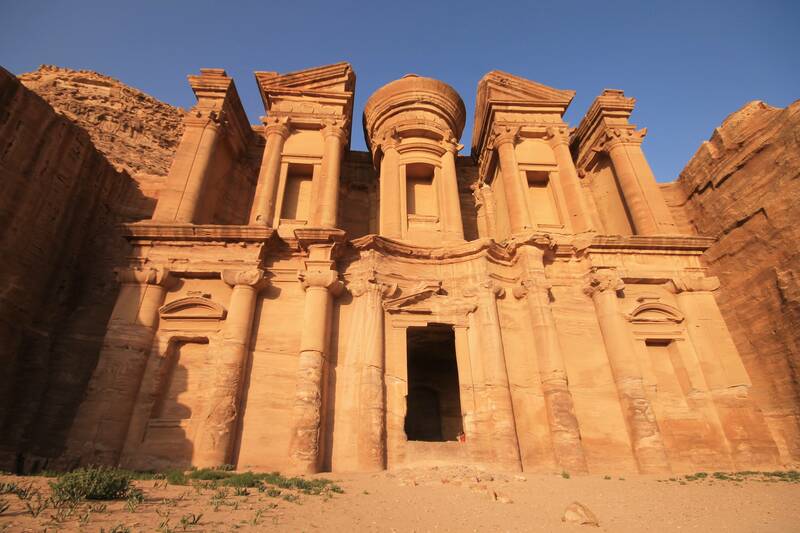 Petra was the stop after Amman and Jerash. 7. Caves infront of the Theatre. Accommodation: Valentine Inn. A good budget choice, merely 4 JD for an acceptable dorm bed, with a fantastic terrace(brilliant view), good breakfast(2.5 JD), a decent buffet dinner(5 JD), free transit everyday to Petra(7 AM and 8 AM) and Petra by night. However, it’s slightly uphill, and if you miss the shuttle, you need to get a taxi. So stay here only if you have a low budget, otherwise get a place close to site itself. And the packed lunch is not enough, you are better off getting food at the site. 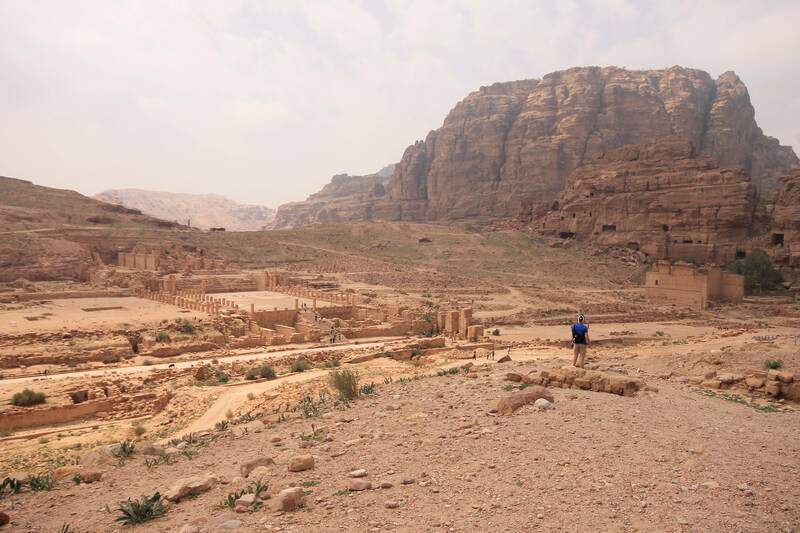 Day 0: Getting to Petra, taxi to Shobak Castle and back and Petra by Night. Day 1: Treasury, Tombs, Monastery, Turkmaniya Road and dinner at a local home. Day 2: Al-Kutbha Trail and Umm Al Biyara hike. Day 3: High Place of Sacrifice and Royal Tombs, caves. 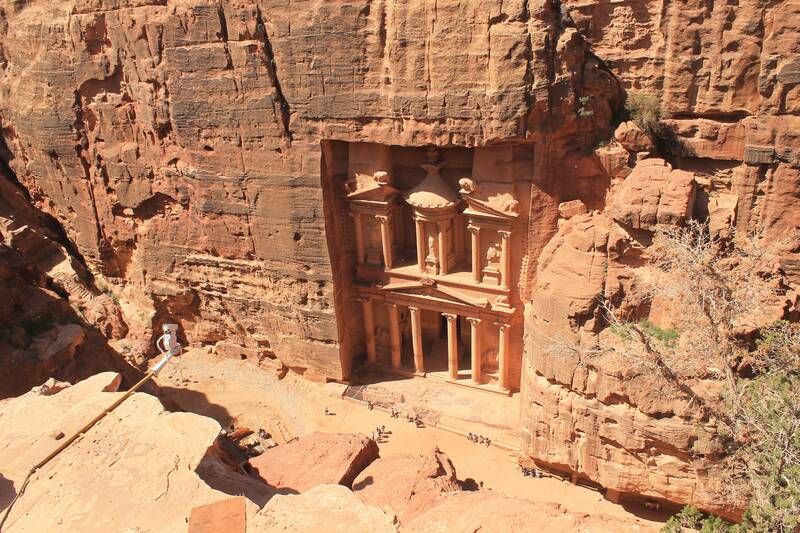 Visiting Petra was a dream since long, and wow..now I so close to Petra!! Had a good Arabic breakfast at the Amman Pasha Hotel . Amman Pasha Hotel’s owner had told me there were a couple of people going to Petra that day, and we could also see the Shobak castle on the way. But again, the plan did not materilize and I had to go by bus. The bus was a rip off, taken from the South Station. I had 2 pieces of luggage, and they could have been places anywhere, but the driver said I should buy 2 tickets and keep them on one seat. I had no choice, because another traveller had done the same( I did complain about it to the Tourism ministry later on, but the bus simply doesn’t have luggage storage facility. ALWAYS USE A JETT BUS TO GET TO PETRA. 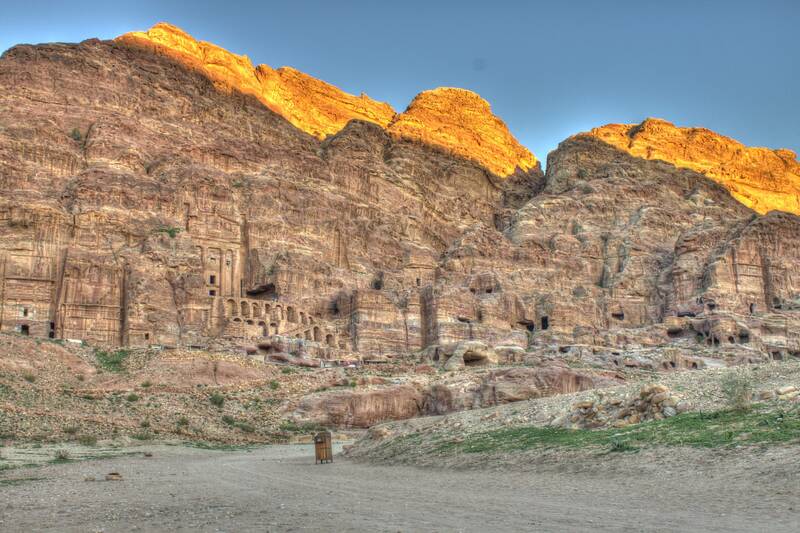 Reached Petra after , I had booked a dorm bed with the Valentine Inn(4 JD per bed, that was such an amazing price) . The hotel van had come to pick me up. The hotel’s terrace has the most fabulous views of the area!! 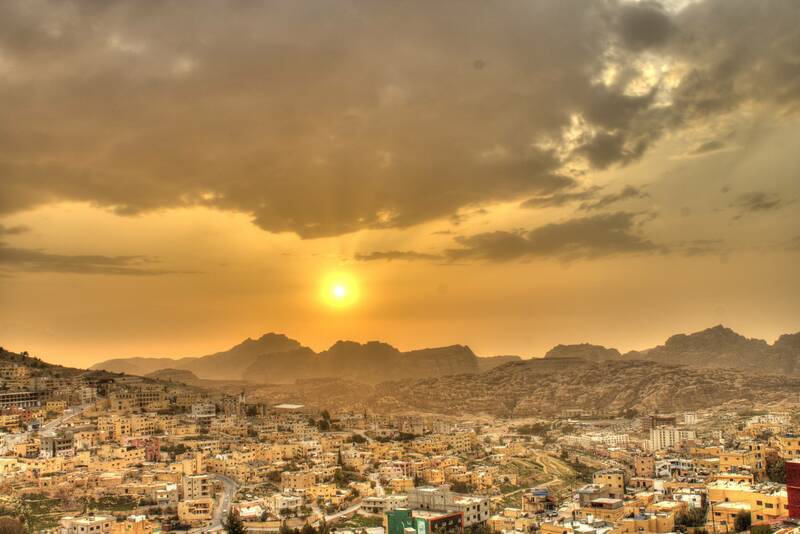 You can see all the HUGE mountains in and around Petra, the entire town of Wadi Musa just sitting from their terrace. I had a good lunch at the hotel, spicy rice, hummus, bread and salad, for 5 JD(I was simply too lazy to get down to the town to find something to eat). Now my to-do list included the Shobak castle, a crusader castle (for an Anti Crusader castle, check, this) located about 25km from Petra. Took a taxi(30 JD return, against Valentine Inn’s 50 JD price). The taxi guy was a very interesting person and a good singer. The castle surpassed my expectations by a very large amount. Firstly, it’s location was top notch, it was in a completely deserted area with nicely eroded hills all around. And then there were tiny specks of greenery which brought in a lot of contrast.And the wind..wow, so that’s castle + wind + remote location. And no people. And the late afternoon light with a cloudiness too was superb. The entire area was like some signature picture of a more exotic country like Yemen or Oman(Jordan too is exotic enough). After spending a good 1 hour, I returned back to enjoy the sunset from my hotel’s terrace. Dinner was buffet at the hotel,several kinds of salads, falafel, bread, rice with meat, spaghetti. I found it really average, although everyone else at the hotel seemed to love it. Petra by Night Experience:Walk fast, overtake crowds and stay back!! 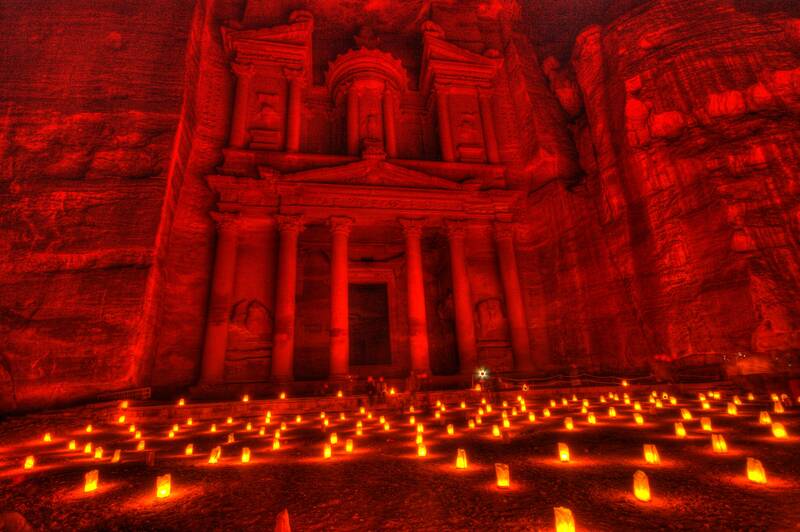 The Petra by Night experience is a must!! 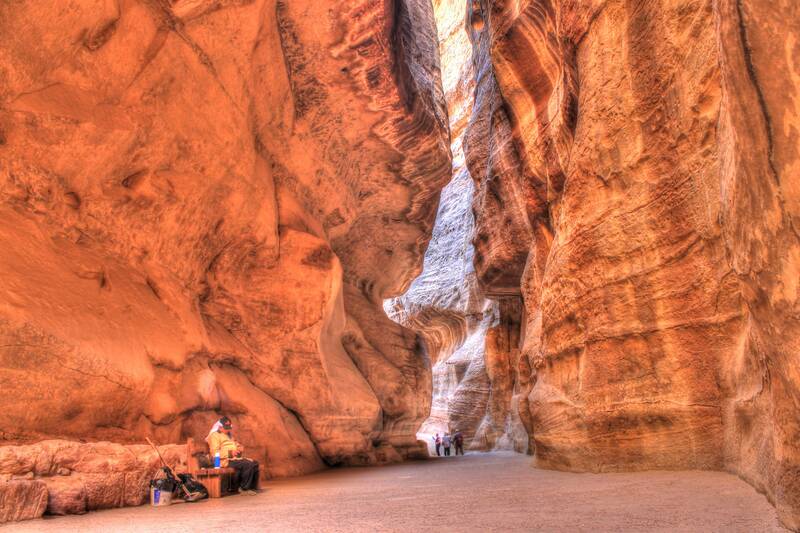 You walk through the “Siq”,the 1,5 km long canyon, which is all subtly lit with candles. It definitely was one of my top experiences. You need to get there early, about an hour before the show starts, and walk past all the crowds into the Siq. 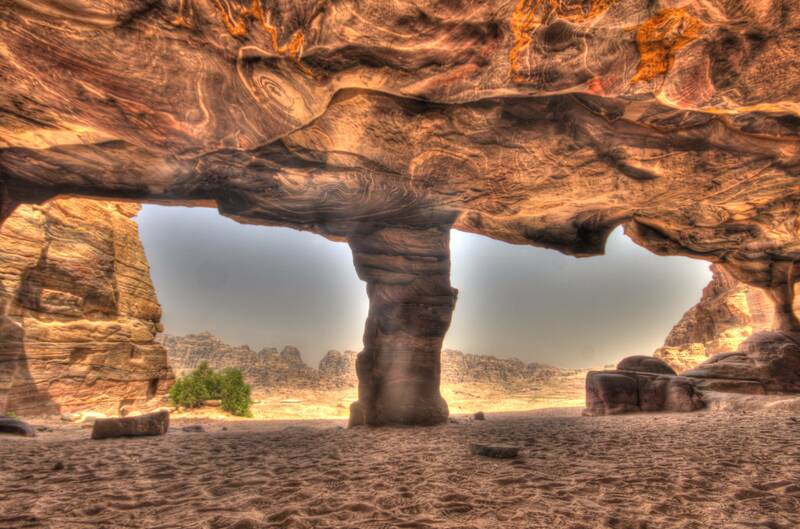 The silence in the Siq is beautiful(you’ll get that only if there are no people!!). After a long long walk, you reach the Treasury, and wow!! I wasn’t prepared at all for anything like what I saw there!! The Treasury facade was lit, and there were thousands of candles infront of it, you can call this one of those “life changing experiences”. And I was among the first ones to reach there. Very quickly a lot of people arrived,and there was just noise after that. Nevertheless, the view doesn’t change. I grabbed a place from where I could easily click photographs. There really was nothing noteworthy about the show , just a little music and a little talking and a spiced tea, which was good, but a little more history telling would have been good. I waited back for most of the crowd to go back, took a lot of pictures and took the long long road back(it’s really that long), the Valentine Inn’s shuttle was about to leave, but I just got in time(yes, they do leave). On the whole, the experience was very evocative, especially walking through the Siq in the dark with just candles on the side and the first view of the Treasury. The First day: Siq, Treasury and Monastery, Turkmaniya Road, home cooked food and plus some hidden pockets. Slept very well at night,so that meant I woke up late and missed the hotel’s early shuttle and had to go by the 8 AM one. The breakfast was fair enough, yoghurt, cucumber,bread, cheese, jam for 2.5 JD. I also took packed lunch, which turned out to be inadequate, I would rather spend a little more and get a good lunch than this. I bought the 60 JD 3 day pass for Petra and got moving. Now I got to see the Siq in broad daylight, every turn amazed me. The color and patterns on the rocks were constantly changing. It got narrow and then it got wide.And then you had horse carriages being driven across. I had reached a little late, there actually were quite a few people, so I was determined to come early the next day. 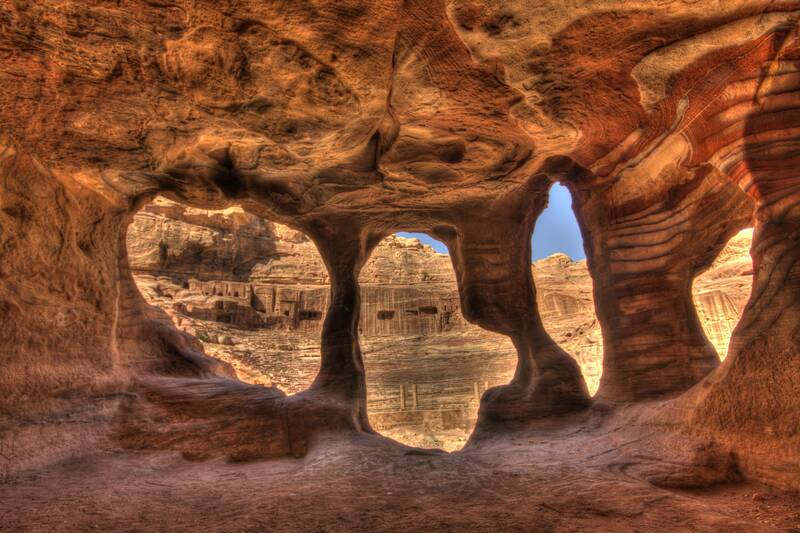 The Siq, the star sight of Petra. The Treasury in day light. The first sight of the Treasury(in day light) was fantastic. The camels added to the ambience, though the tour groups reduced it. 8.30 AM is not too early, you should come at 6.30 AM to have it all for yourself. So I took the path to the Royal tombs and came across some amazing caves and views. 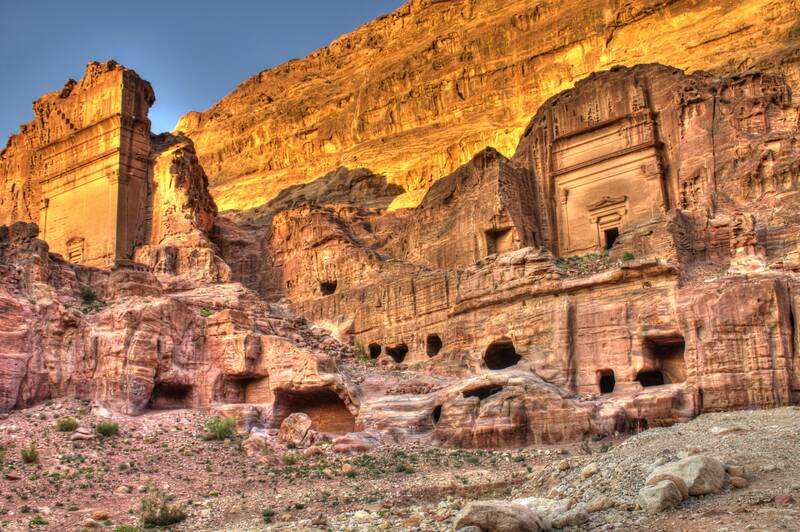 To get the best out of Petra, you need to wander about and explore. Next was the Byzantine mosaics, which were brilliant, rather the whole setting was great. And then the Roman temple. The view of the Roman Temple from the Byzantine mosaics itself was brilliant. Had lunch at one of the outlets, 5 JD for an omlette,salad and bread, pricey. I guess it’s better to spend a little more and get a good buffet for 10 JD at the restaurant next to the Basin Restaurant. 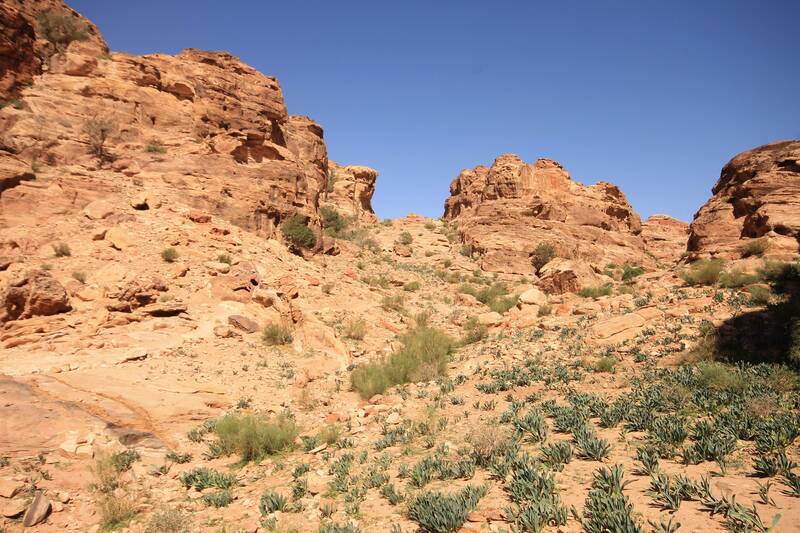 Just one of Petra’s small hikes. Next was the hike to the Monastery, an 800 steps “hike” which was very easy actually, but locals seem to be getting good business from riding people up on donkeys. The monastery facade was brilliant!! And then you walk towards the “Top of the World” view points, and wow.. the monastery looks even more surreal. It’s perfectly embedded inside the mountains surrounding it. 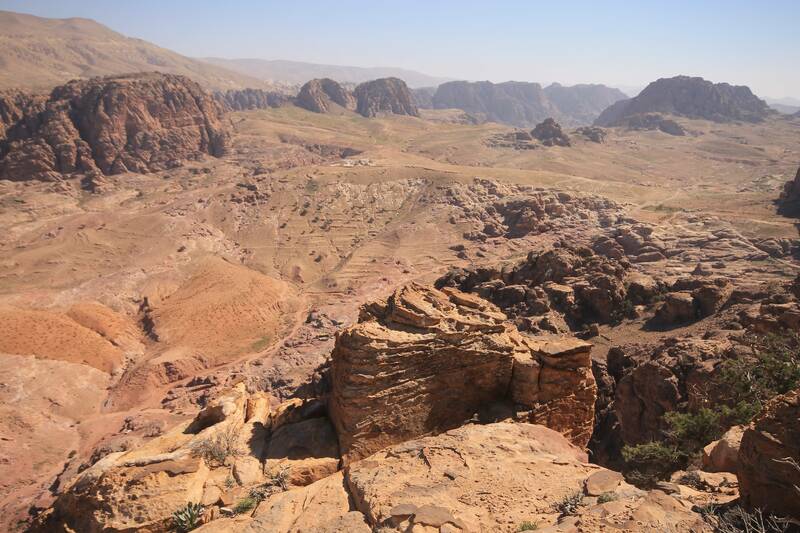 The view of the entire mountain range around Petra was overwhelming. That’s where I met a local guide, who was also a tea-stall owner. He offered to take me up the monastery, a tiny hike, but not someting to be attempted on your own, because there’s a bit of rock climbing. We then started off to his(guide’s) home in the village near Petra, a slightly long walk through the Turkmaniya Road. 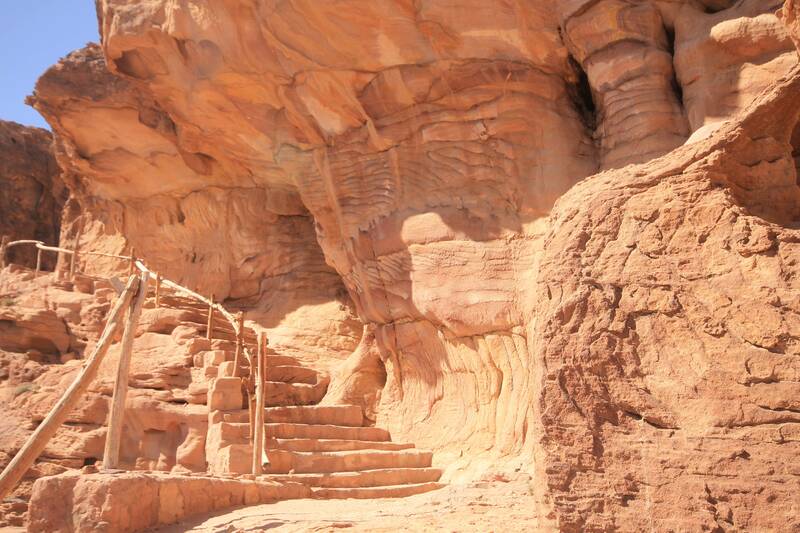 This walk was one of my favorite experiences in Petra. Partly because of the greenery in “wadi”, and the beautiful evening light, and good company. The guide’s home wasa fairly simple one, and his sister cooked tomato galaya, fried vegetables and fried egg for us. The tomato galaya was like our Gujarati sev tameta dish(Indian dish), without the sev. And the local bread was really awesome, thin and soft. I wish they could have that in Wadi Musa, or in any of the restaurants I ate in Jordan. So ended the first day, long and tiresome, yet very rewarding. So I woke up early, and went to Petra at 7 AM. The Siq looked even more majestic witout any people, except the occasional traveller or horse carriage. Headed straight to the Al-Kutbha trail, which is right opposite the Theatre. The theatre too is marvellous, looks very different from the marble Graeco Roman ones, mainly because of the color of the stone I guess. The hike up was fairly moderate. 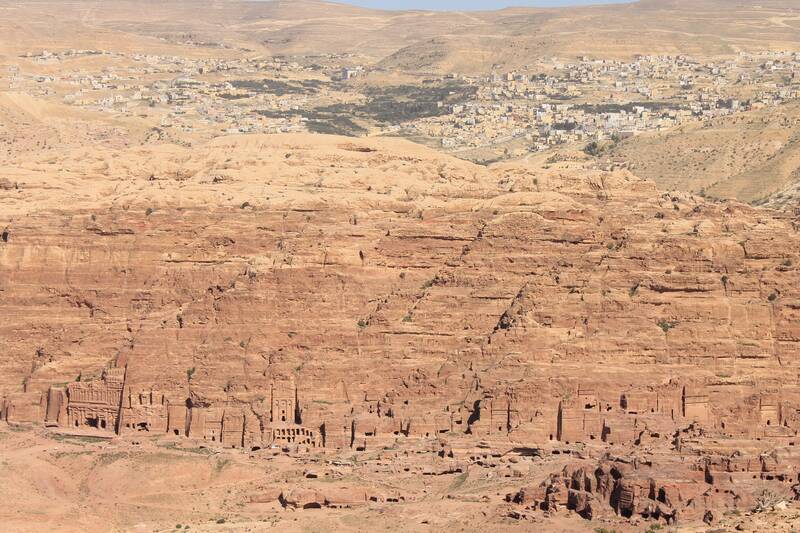 You reach a point when you can see the theatre and the entire colonnaded street in Petra. It’s a sight to be seen, and the wind is gorgeous. After that there were a couple of confusing points, but you manage to get to the point from where you can see the Treasury from the top. The descent was obviously easy. But make sure you reach here fairly early in the morning, so that the sun shines on the Treasury, even at 9.30 AM there was no direct sunlight on the Treasury. The Treasury seen from the top. 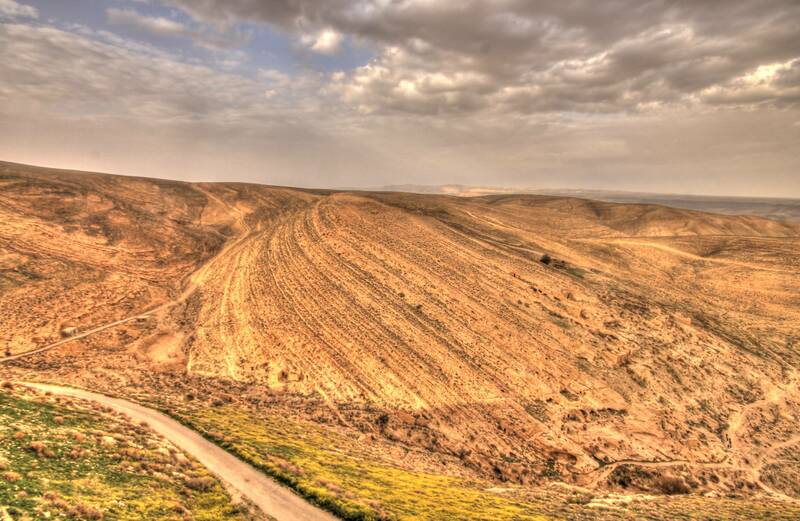 The next destination was Umm-Al-Biyara. 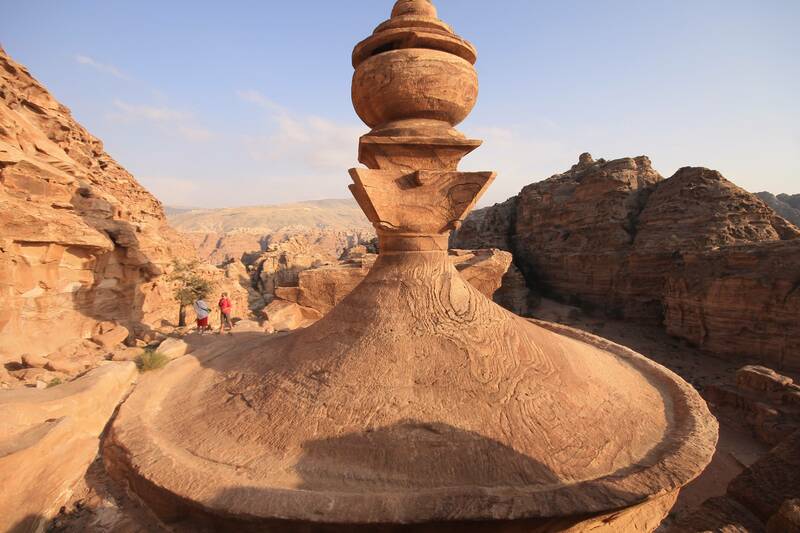 It’s big mountain in Petra. 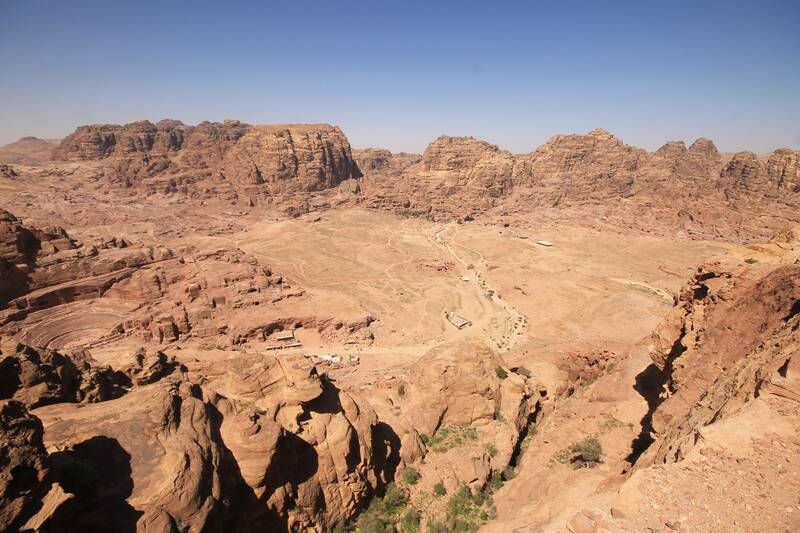 It’s huge, it’s a plateau and has THE BEST VIEWS in Petra. You walk up and down a little, from the rear part of the Roman Temple and then somehow you’ve got to find the stairs leading up. It’s not so obvious, but your direction sense wil get you to it. I climbed up the easy stairs in about 45 minutes or so. The views just got better and better. You could see entire mountain ranges, all the tombs, the place of Sacrifice, absolutely everything. And surprisingly, there was quite a bit of greenery there. And a bunch of Archaeologists. 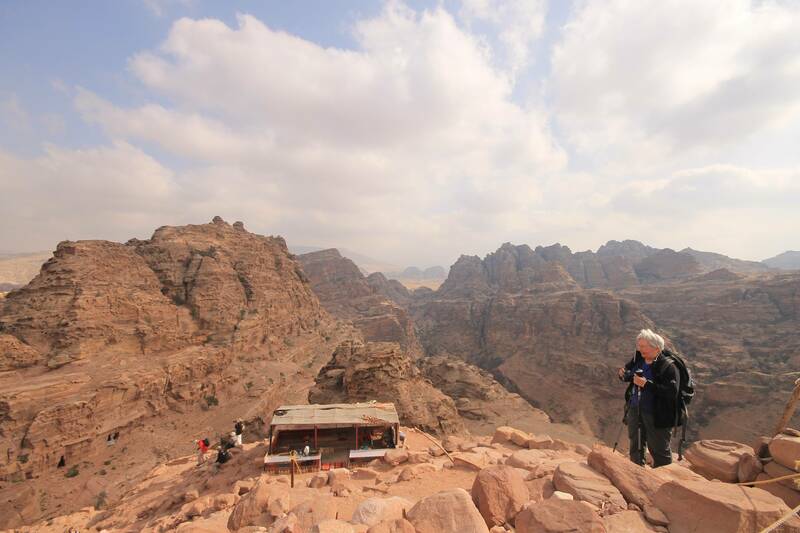 This too turned out to be one of my top 10 Jordan experiences. It was almost sunset by the time I came back, took the long walk back to the entrance. Had dinner at the Suncity Restaurant, a big mezze plate and lentil soup for about 8 JD. The potato filled sambousik was particularly good. Although it was the 4th time I was going through the Siq, it was really no less exciting. The guy at the ticket counter made sure the 3 day Pass I had bought was mine, not a reused one. He checked my ID, checked if I had photos of the site from the previous day, I guess people of my age, backpackers must be sharing tickets. So if any of you plan to do that, go with the big crowds, don’t go early in the morning. The hike up the Place of Sacrifice was fairly easy, and views from the top again, were fabulous. It’s THE place for breakfast with a view. 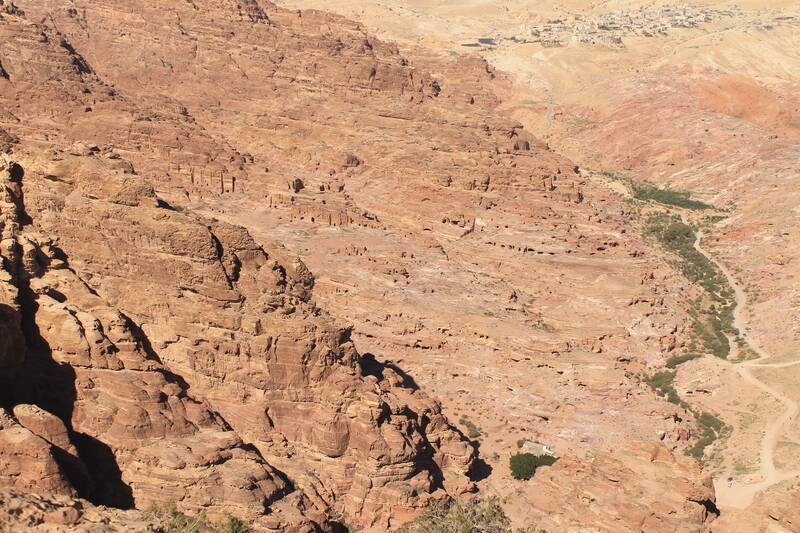 This was the first time I saw a few people on a hike in Petra. All my previous hikes, except the monastery were deserted, but don’t get deterred, it’s nowhere close to the crowds you see at the Treasury. The descent route through Wadi Farasa was very interesting. You get to see a carved lion(am I correct? ), several holy places from the yesteryears and it was the Royal Procession route, I’m sure it must have been a very happening place at that time. I wish I had done this in the evening, when the light would have been less harsh, but still, it was a great walk. Had lunch at the restaurant next to the Basin Restaurant, 10 JD for a decent buffet, salads, hummus, pasta, rice, lentil soup, desert, very refreshing after the long hike. I found a place to relax next to the museum and spent a lot of time watcing documentaries on the middle east and the Ottoman empire. The rest of the evening was spent exploring the area around the Royal Tombs, here I had a few interesting encounters. While buying a souvenir, I was haggling a little, the seller says, “ Have mercy on me, I have 2 wives and 23 kids”..haha. Then another young bedouin asks me, “Indian?”, I say “Yes”, he asks, “Muslim?”, I say “No”, off goes the interest, and he vanishes. But otherwise Bedouins were great people. The Royal Tombs were spectacular, almost all of them, but it was a shame that they allowed a big souvenir stall right at the biggest Tomb. Walked my way back to the entrance, had a buffet dinner at the Petra Zaman Hotel, a fair buffet, plenty of dishes for 7 JD, with fruits and deserts. Not a bad end to a good day. 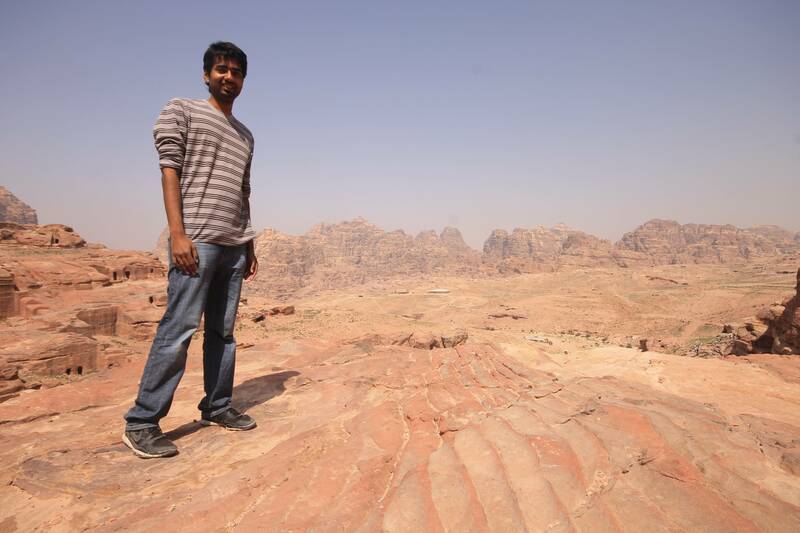 Next destination was Wadi Rum. That happened everyday!! People were big fans of Salman’s movies too, especially youngsters, they used to be disappointed when I used to tell them I haven’t seen even one..LOL. Brilliant coverage and beautiful pics. Planning to go next march ! Have a good time!! March is the perfect time to go. Thanks!! 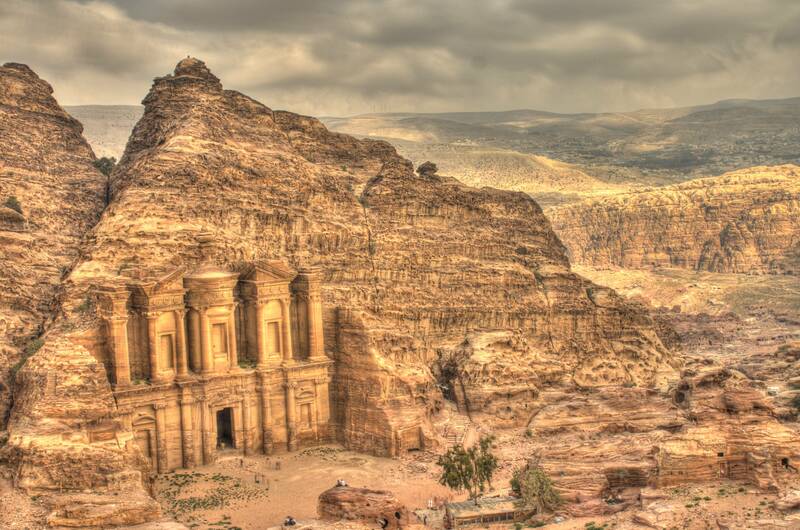 You should visit PEtra! 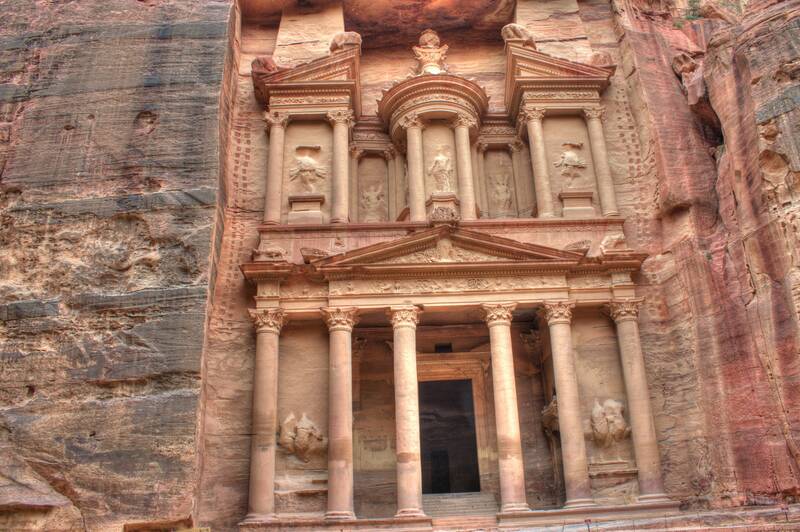 I am going to Petra in a couple of months and found this information really useful. How did you manage to get in early for the Petra by Night tour? I would have thought they would prevent anyone from going in an hour before the tour starts. Thanks a lot! Yes, you need to get there early and wait at the gates and walk fast initially so that you’ll be well ahead of the crowd.